All shows will be FREE, outdoors on the plaza. Bring blankets and lawn chairs. Bicycle parking stations will be available. 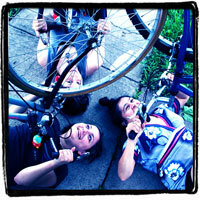 She: Bike/Spoke/Love excerpts will be performed at the first Ciclovia-style event in Austin, Texas, on Sunday, May 20, 2012. "Viva Streets" is taking place in East Austin; hope to see you there! On the night of our premiere, we were amazed at the number of people who turned out to see the show. Unfortunately, we had to turn away over thirty people, and the Sanders was at full capacity, standing-room only. Due to popular demand, we decided to present two more Fort Worth performances in November 2007. Please email sound_culture@hotmail.com for more information and to book performances of our show at your theater, performance venue, or bicycle festival.